Someone once said that a perfect collection of jewellery is not complete without an opal. And how true that is! This simple but unique gemstone allures with its flashing colors, gorgeous patterns and beautiful body tones. It can also be a tricky stone to value as there are a number of factors that need to be taken into account when choosing an opal. These factors include the type of opal, body color and tone, brilliance, the patterns, carat weight, clarity and whether it is natural or synthetic. With such a long list, no wonder it becomes confusing to shop for an opal! To avoid overpaying or being conned, having this information in the bag will be invaluable. So, without further ado, let's walk through this opal shopping guide that hopefully will make buying your next opal a whole lot easier! Once you have the answer to those two questions, it makes it easier to narrow down your options as you shop for an opal. Precious Opal - This stone shows a very unique effect known as play of colors. But what does that mean? 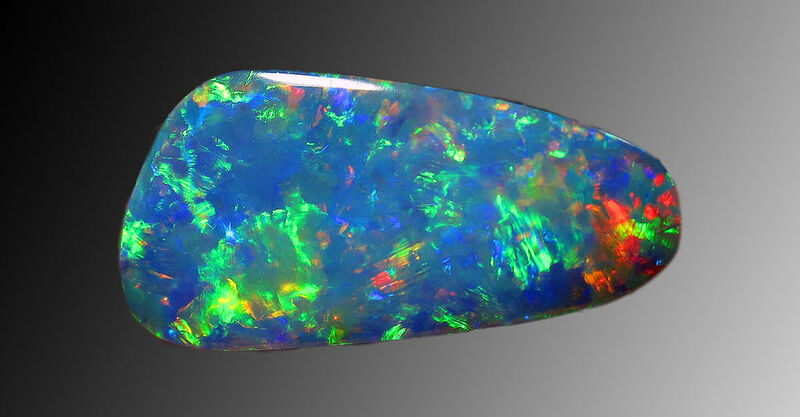 Play of colors refers to the flashing colors and patterns that is seen in precious opal while it is rotated. To understand why this occurs, it is important to know that opals are composed of hydrated silica spheres. In the precious opal these spheres are similar in size and arranged in an orderly, three-dimensional array. The beautiful play of colors is produced by the diffraction of white light at the spaces between silica spheres. The size and spacing between these spheres determine the range of colors that is seen in precious opals. For instance, smaller size spheres produce blue and violet (the most common color) and larger spheres produce orange and red (the rarest color). It is worth noting that the rarity of colors that is displayed in a precious opal is as follows: blue, green, yellow, orange, and red. Common Opal - this type of opal is usually opaque (rarely translucent) and does not display the play of colors. This is because the silica spheres in common opals are not equal in size and are randomly arranged. Common opals usually occur in white, grey and brown and are sometimes found in yellow, green and blue. 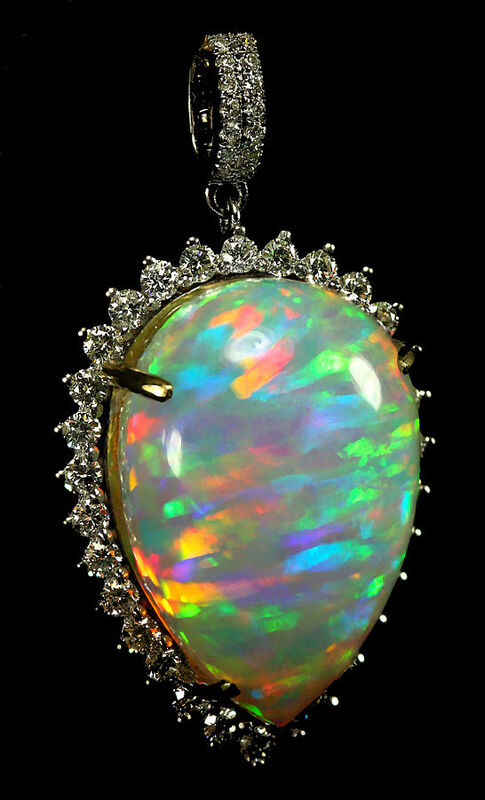 As no play of color is observed in common opals, they are valued by their body color. The term “common” in the name refers to the fact that this type of opal is found in many places around the world. It should be noted that, as common opals do not show the play of color, they are far less valuable compared to precious opals that exhibit the play of color. Black Opal - this type is usually the most expensive and sought-after type of opals. This is because the black body (background) intensifies the beauty and the fire of the flashing colors. Black opals are rarer than other types of opal. Make sure you buy the black opal from a trusted seller who will provide you a certificate of genuineness issued by an independent Gemological Laboratory. That way you know for sure that what you are buying is the real deal. Fire Opal - is the term used for any transparent to translucent opal with a yellow to orange to red body color. While some fire opals show the famous play of colors, most do not. The value of fire opals is a direct function of its color uniformity, meaning the more uniform the color, the more expensive the fire opal will be. Due to its rarity, fire opals with red body color are the most valuable followed by orange and yellow fire opals. Boulder Opal - in this type, a thin layer of precious opal is formed on dark brown ironstone rocks. When viewing the boulder opal from the back, a thin layer of black rock can be seen. Due to this observation, boulder opals are sometimes called a ‘natural doublet’. This formation of opal on black ironstone gives the boulder stone a dark body tone (like black opals). However, it should be noted that boulder opal is less valuable compared to black opal. White Opal - (also called milky opal) as the name implies, this type of opal can be identified by its pale white body color. These are the least valuable type of opal for two main reasons. 1) they are the most common type of opal 2) due to the color, play of color is less intense in a white opal. body tone is one of the most important factors determining the value of opals. 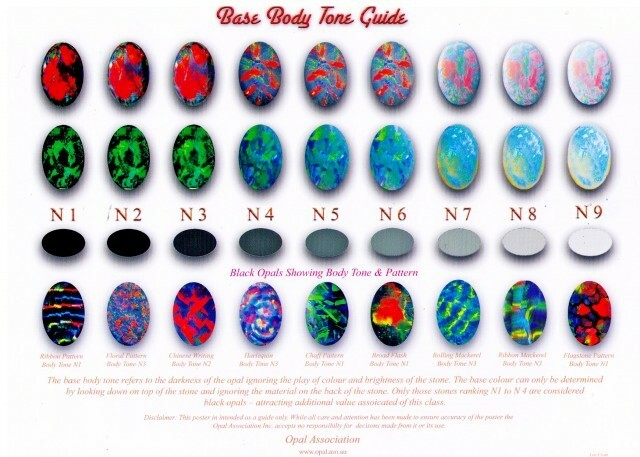 Body tone refers to the background color of opals and it varies from dark to light (N1 to N9). Generally speaking opals with black body tones are more valuable as compared to opals with white or light body tones. This is because the play of color is more accentuated in the black background. Brightness refers to the intensity or the vividness of color that is reflected back by the opal. Brightness is one of the important factors that determines the value of opal gemstone. There are three brightness ratings – Subdued (also called dull), Bright, and Brilliant. 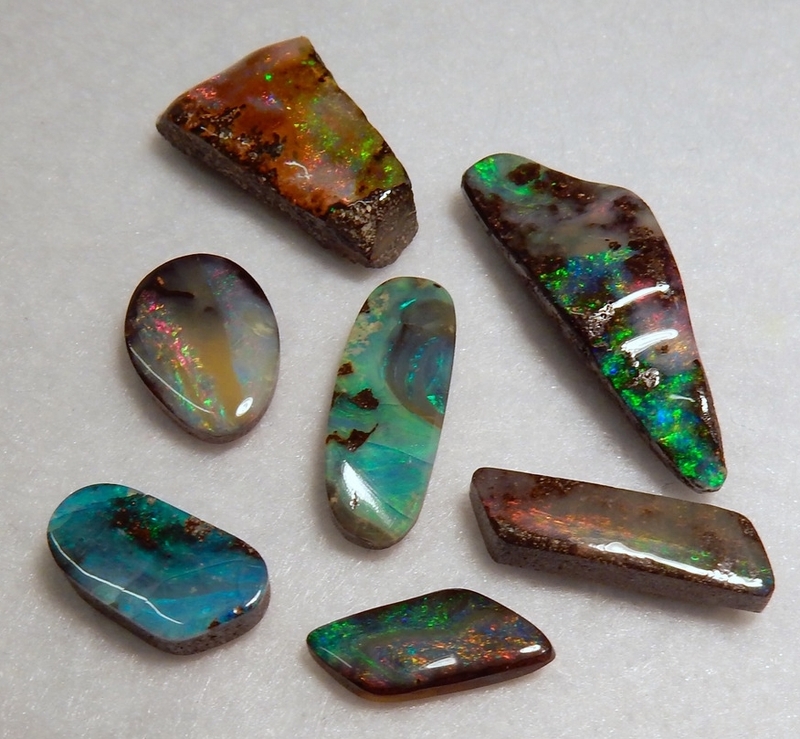 Subdued opals have the least brightness and therefore are the least valued opals. Bright opals display higher level of brightness and they are more expensive as compared to dull opals. As the name implies, Brilliant opals show excellent flashes of color and therefore these opals are the most expensive and sought-after. Pattern refers to the arrangement of the diffracted colors in precious opals. As a general rule, the more color an opal displays, the more valuable the stone will be. If there is more of a reddish hue in the color combination, the value of the opal increases even more. If you are interested in identifying the common patterns of precious opals, read the section below. Harlequin or mosaic - a harlequin pattern is made up of color patches, usually squares, all roughly the same size and shape just like mosaics. This pattern is very rare and therefore is extremely expensive and sought-after. As the harlequin pattern is very rare, it is recommended to buy these from a trusted seller. Chinese writing - this pattern is made of short and large strips of overlapping single colors against a dark background which resembles the Chinese characters. This pattern is also very rare and valuable. Ribbon - a ribbon pattern is made up of parallel bands of rolling color. Opals are more valuable if the colors of parallel bands are different and especially if the color bands contain more red. Straw - this pattern consists of thin random color lines. 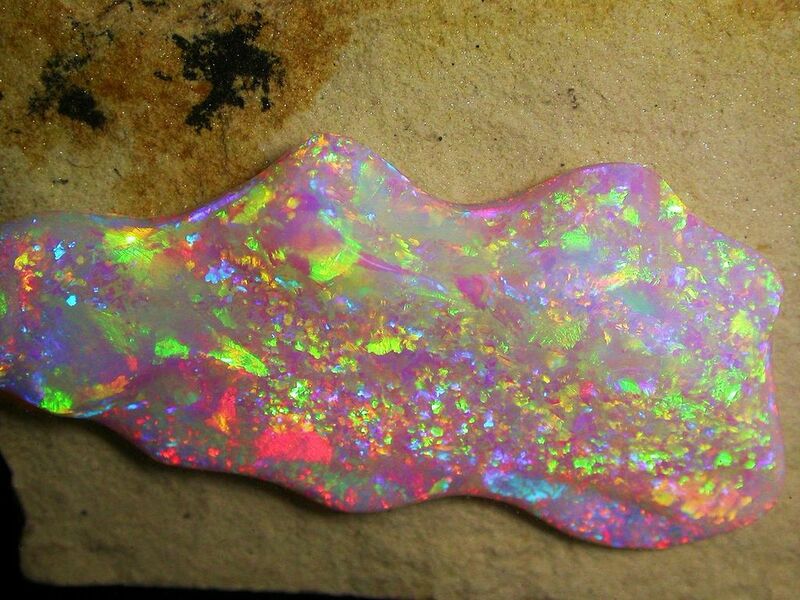 Picture stones: the pattern in this kind of opals resembles an object, landscape, animal, or person. Pinfire - a pinfire pattern is made of closely spaced, small color points. The overall appearance of opals with this pattern often does not change regardless of the angle in which it is viewed. Flash - in the flash pattern, the movement of opals will cause a change of color for a large area of the gemstone. This pattern is divided into two sub-categories; rolling flash and broad flash. The flash pattern is a popular gemstone for rings, as the color of the ring changes significantly with the movement of the hand. Floral - this is the most common color pattern. It is made of random color patches with a good spread throughout the gemstone. Moss and Grass - these patterns are the least valuable. The pattern resembles the structure of grass or moss. Generally speaking opals with larger patterns are more valuable than opals with smaller patterns. Another factor that needs attention when evaluating the color and pattern of precious opals is dead spots. A dead spots in a precious opal refers to the areas where no play of color is displayed. Care should be taken as these dead spots decrease the value of precious opals especially if several of them are present in the gemstone. Size is important in determining the value of opals. As with other gemstones, larger opals are more valuable. However, the impact of size on the value can be tricky in the case of opals. For instance, boulder opals may be large and have an increased carat weight but this could be due to the backing layer and not the actual precious opal. The presence of inclusions or flaws affects the value of the opal. For instance, many natural opals come with sand in the back of the stone or might contain fragments of its host rock, called matrix. Although the existence of these inclusions can be evidence that it is indeed a natural stone, too many inclusions can decrease the opal’s value. The existence of small cracks (crazing) on the face of opals is another common flaw that determine the clarity and hence the value. These cracks occur due to the dehydration of opals. Doublet Opals - Doublet is a man-made stone. Usually if the precious opal is not thick enough to be used directly in jewellery, it is glued on a black backing (either a black plastic or black potch) to imitate the appearance of solid opal. As one might expect doublet opals are less valuable compared to solid black opals. Loose doublet opals can easily be identified by looking at the stone from the side as the line where the precious stone and black backing meet will be perfectly straight. However, if the stone is mounted in jewellery, it is extremely difficult, even for experts, to distinguish solid precious opal from doublet opal. For this reason, once again it is very important to buy your opal jewellery from a trusted seller. Triplet opal - a triplet is a hand-made stone. Very thin slices of precious opal (even thinner than the ones used in doublets) are used in the triplet structure to mimic solid precious opal. 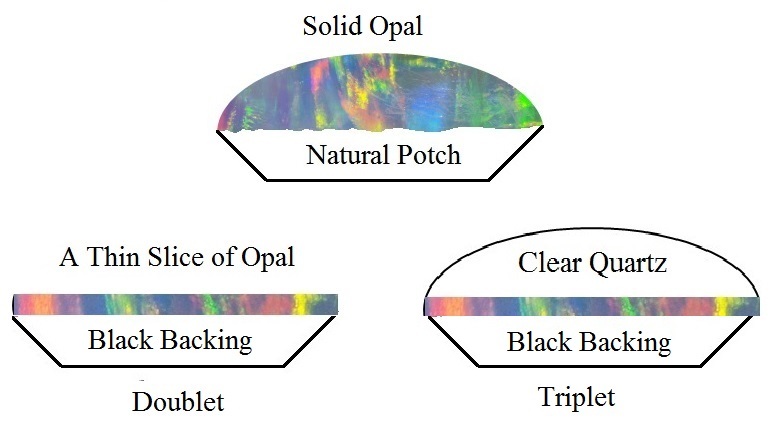 In the triplet structure thin slices of precious opals are sandwiched between a layer of black backing and a layer of clear quartz or glass (as shown in the picture). Identifying a triplet opal is usually easy as triplets have a glassy appearance, due to the presence of the clear quartz capping layer, and they also reflect light differently. In addition, if they are not mounted in jewellery, viewing the stone from a side angle would assist in determining if it is a triplet or not. Triplets are usually cheaper than doublets as they contain less precious opals. It is also worth noting that both doublet and triplet opals become ‘cloudy’ after a while. This is because over time, the glue that holds the layers in doublets and triplets will deteriorate allowing water to penetrate into the structure. The density of synthetic opals is usually lower than that of natural opals. Therefore, they tend to be lighter than natural opals. There’s nothing wrong with buying synthetic opals, however it is very important to note that synthetic opals are cheaper than natural opals. Therefore, the best way to avoid over-paying is to buy opals from reputable dealers who have gemmological qualifications and can provide you with a certificate of genuineness. Opal is a relatively soft gemstone, therefore it is best used in jewellery such as earrings, pins and pendants. Although it is not advisable to use opals in rings as the chances of damaging the stone are high, it is still a popular gemstone for rings. If used in rings, it is best to choose a design that would protect the stone, such as a bezel design. An opal with a cabochon style tends to show off the play of color the best and so are highly popular for ring designs. For some opals however, such as fire opals (which do not have the play of colors), a faceted cut optimizes the color of the opal's body. Cleaning opal in ultrasonic cleaners is a very controversial topic. Common belief is to avoid cleaning opals in ultrasonic cleaners. However, Justin, as Australian opal expert, believes depending on the type of opal, it is alright to clean opal gemstone in an ultrasonic system (please watch the following video). As mentioned before natural opals contain water. If this water evaporates, small scratches develop on the surface of the opal (crazing). This can be avoided by wrapping opal jewellery in a soft moist cloth. Opals should be kept away from perfumes and hairsprays as these chemicals will deteriorate the brightness of the opal gemstones.